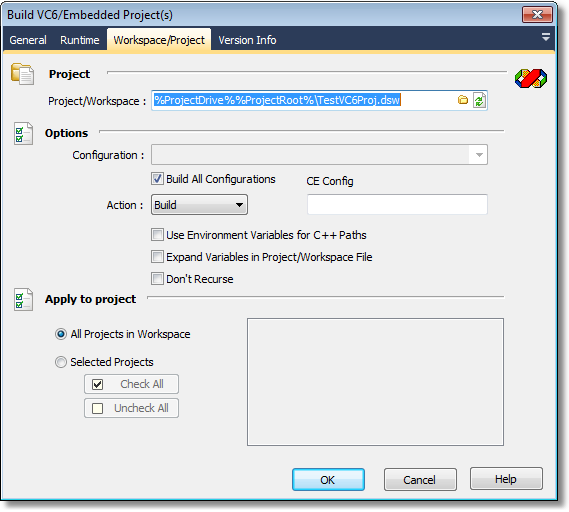 This action provides the ability to build Visual C++ 6 projects and Workspaces. You can choose to build/rebuild/clean all projects in a workspace or selected projects. You can also choose the Configuration to be used (this configuration must exist in all projects in the workspace). Project/Workspace - enter the name of your project or workspace. The project/workspace types allowed are Visual Studio project file (.dsp), Visual Studio Workspace (.dsw), Embedded VC++ 4.x Workspace (.vcw) or Embedded VC++ 4.x Project (.vcp). Use Environment Variables for C++ Paths -Use PATH, INCLUDE, LIBPATH, and LIB environment variables instead of IDE paths for VC++ builds. 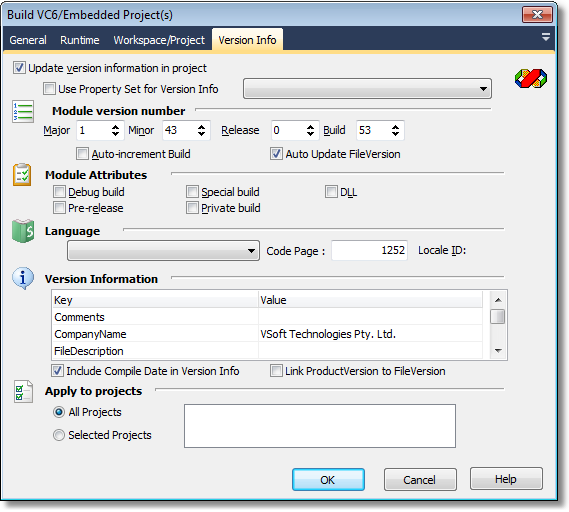 Expand Variables in Project/Workspace File - By default FinalBuilder variables aren't expanded for the Project/Workspace files, turning this option on will expand variables. FinalBuilder can also update the version info in the project. It does this by searching the .rc files in the project for a VERSIONINFO structure. At runtime it will backup the original xxxx.rc file to xxxx.rc.orig and generate a new one with the updated version info. You can choose to apply the version info to all projects or selected projects in the workspace (the list of projects is dependant on what is selected on the project/workspace tab). To Auto Increment the build number, make sure the Auto-Increment check box is checked. property BuildAction : TVC6BuildAction; Valid values are : baBuild,baRebuild and baClean. The BuildType property determines whether All or selected projects in a workspace are built. property SelectedProjects : TStrings; //The selected projects that will be built. property SelectedVI : TStrings; // the projects the version info will be applied to. property VIType : TVC6VIType; Valid Values are : viAllProjects,viSelectedProjects //determines whether version info will be applied to all or selected projects in the workspace.